Jotia is a very interesting modern neo-humanist typeface that takes its inspiration from a very unusual source – lapidary inscriptions. 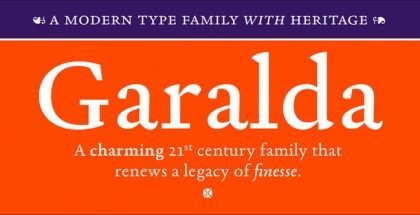 The most characteristic feature of this unique typeface is that it is a semi-serif – a perfect combination between serif and sans-serif which allows it to take the best of both worlds. It is a great advantage for Jotia as it means that it can work with great success with other typefaces which makes the fulfilling of elaborate editorial projects much easier and the result – much more vivid and dynamic. Also, the typeface is designed in such a manner as to work equally well in different types of graphic design environments – print, web, motion graphics, etc. making it a perfect tool to cope with any challenge. Overall, Jotia font family is best suited for use in headlines mostly but it will work quite well in various text lengths too. 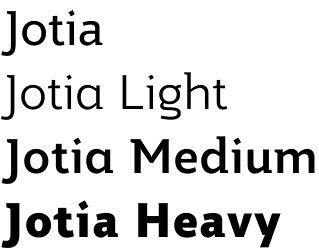 Jotia family includes 6 fonts – Thin, Light, Regular, Medium, Bold and Heavy which cater for every need. Each font offers none less than 430 glyphs and full European character set with extras like alternatives, fractions, standard and discretionary ligatures, old style and lining figures and more. Jotia font family is created by the British designer Rebecca Hurst and is published by the well known The Northern Block type foundry. We can do nothing but express our admiration for The Northern Block for the amazingly talented designers it works with. Rebecca herself made a great impression to us with her debut Grottel font that was even included in our selection of 14 impressive font debuts. Get Jotia typeface and enjoy an amazing work!